Gelatine is extracted after acidulation, Maturation & Washing. It is extracted in stages. The initial extracts are obtained at low temperatures and have the highest gel strengths. Subsequent extracts are made in stages of higher temperatures. The process technology perfected by the company ensures complete and total extraction of the gelatine. 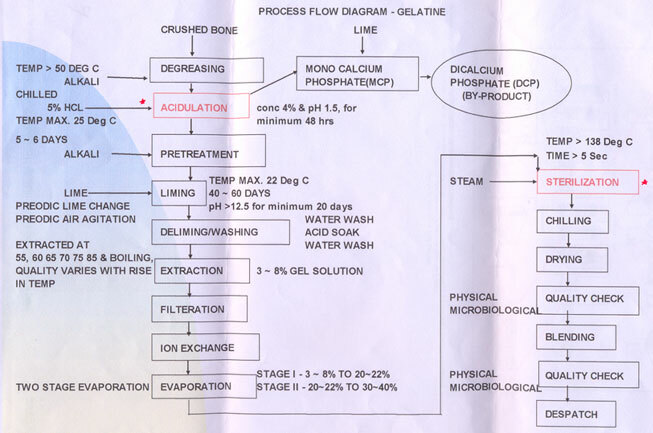 The Gelatine solution obtained from the extraction process is subjected to intense filtration and ion exchange. This ensures effective removal of physical and chemical impurities. With effective usage of energy, water is removed from the purified solution and the Gelatine is gently concentrated to a honey like consistency. This highly viscous solution is once again passed through polishing filters capable of removing even the finest suspended particle and is simultaneously sterilised. The concentrated gelatine solution is solidified and a continuous flow of jelly noodles are produced. These noodles are evenly spread on a continuous band drier. The drying operation is systematically controlled with filtered, washed, pre-dried and sterilised air. The dry gelatine is mechanically reduced into uniformly granular sizes. Depending upon the end use requirement and specification the dry gelatines are transformed into consistent despatchable material. Various high speed mills and large capacity blenders are used depending on specific requirements at this stage. Design by Web-Werks India Pvt. Ltd.